Leftover rotisserie chicken in our household often turns to chicken noodle soup or the Filipino style sopas. Sometimes, when the mood strikes I make some kind of pasta dish out of it. Those didn’t quite appeal to me this time. 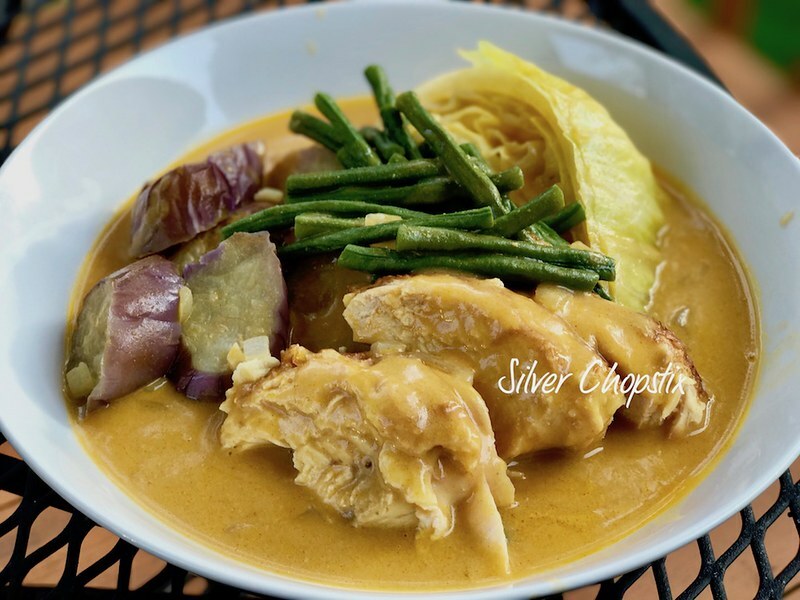 Kare-Kare was in my menu for the week but I was hesitant to make a new dish since we still have leftover roast chicken. This was where inspiration struck. 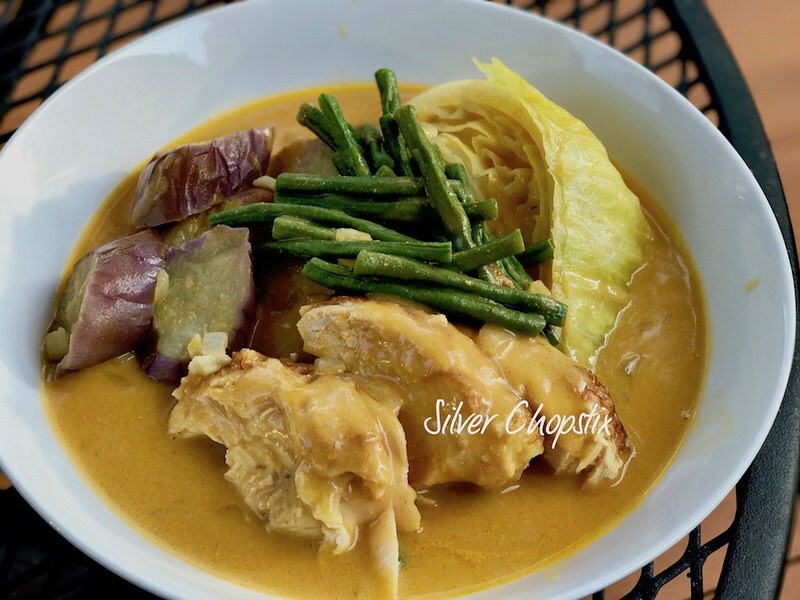 Making Kare-Kare usually starts with boiling some kind of meat, what is great with this recipe is that your cooking time get’s shortened. 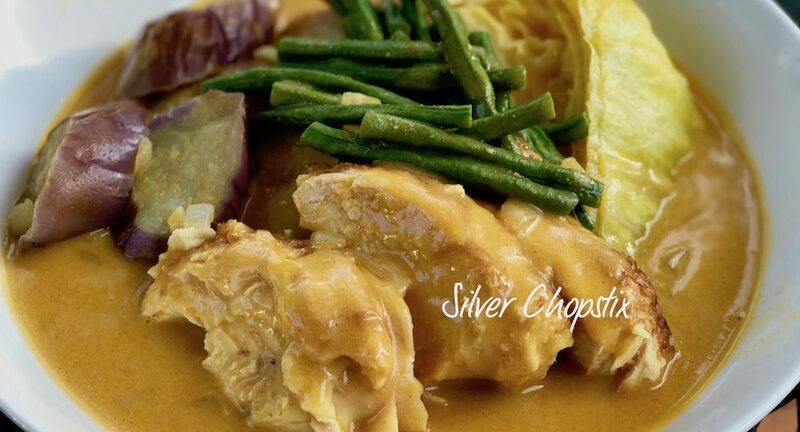 You don’t have to wait for the meat to become tender since your chicken is already fully cooked. I just placed the leftover chicken, bone and all in a medium sized pot and added water until it’s almost covered. Then added 1 onion peeled and cut in half and let this simmer for like 15 minutes. I removed the chicken and cut it into manageable pieces and strained the broth and set these aside. In a deep pot heat some achuete oil and sauté one diced onion and 2-3 cloves of finely minced garlic. Let this cook until fragrant. Then add about 4-5 cups of your broth and let this come to a boil. Add 1/4 cup creamy peanut butter diluted in some of the broth and stir until dissolved. Season with salt or fish sauce to taste. Add your vegetable starting with the longest to cook, in my case I added the cabbage, yard beans and eggplant in that order. I also made a cornstarch slurry to thicken the broth a bit. To serve, arrange your chicken pieces in a deep bowl, then add your vegetables before adding your broth or sauce over it. This is typically served with shrimp paste on the side and eaten with steamed white rice.